In “The Logo Decoded,” Lora Starling adds some fascinating information about the meanings of each of the five shapes identified by Angeles Arrien as carrying universal meanings across cultures. Though Angeles Arrien always uses the triangle shape in its most stable form, an equilateral triangle with the flat base down, it’s also possible to envision the heart symbol as combining the circle’s curves with the triangle, pointed down. Earlier as an artist-blacksmith, then as a mixed-media vessel sculptor and now as a heart painter, I’ve found inspiration from Angeles Arrien’s research on the five “universal shapes.” Recently I became curious about how other artists are using them. I came across both interesting artwork and useful art activities for personal growth. The artists mentioned in this article gave me permission to link to their work and use their images here. Note that each artist reserves all rights to her own images. If one captures your attention and you want to copy it, please ask the artist for permission to do so. If you have already experienced Angeles Arrien’s Preferential Shapes Test, it won’t surprise you at all that any specific artist seems to have a preferred shape. Nor will you be surprised to observe that an artist’s shapes change over time. When I began learning to forge iron, it was evident from the first thing I made that I loved the triangle shape; soon the spiral became another favorite. In "Signs of Life," an article on her website, jeweler Debbe Kennedy says she also picked the spiral from the five shapes. "The Centered Heart" © 1996 Catherine Jo Morgan - "Chi Energy Bag" -- mixed media vessel of fusible web, unryu paper, silver ink, cords. Labyrinths usually use the spiral form. An article by Rachel Zuses, "Labyrinths: Walking a Spiral path," shows some variations. Back when I was making soft cloth-lined paper vessels as "chi energy bags," I painted labyrinths inside a few of them. For example, see "The Centered Heart" at left. Painter Ann Bell incorporates all five shapes into her paintings. If you look closely at the large paintings she has done, you’ll find the shapes nicely integrated. She wrote a good article on "The Five Univesal Shapes by Angeles Arrien" but that seems to have disappeared. "A Light Mood" by Ann Bell, 22 by 30 in. mixed media. All Rights Reserved. Angeles Arrien notes that “Mandala is Sanskrit for ‘that of essence (manda — essence; la — of).’” The word “mandala” is also sometimes loosely translated as “circle,” and we usually expect a mandala to be circular — symbolizing wholeness, integration. Within this emphasis on wholeness, however, artists sometime incorporate other of the five universal shapes. 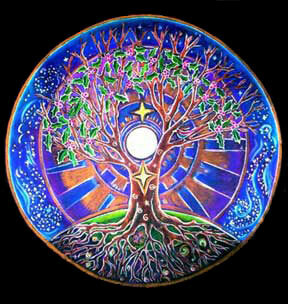 "Magic Cross" earth mandala by Komra Beth Salo. All Rights Reserved. 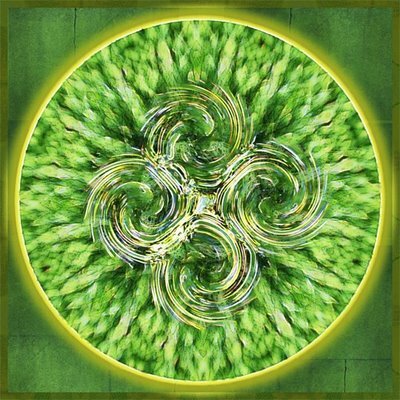 Digital artist Komra Atiri Cheyean Moriko makes her Earth Mandalas [link] from photographs of nature. While her mandalas are circular, some emphasize a triangle or cross. This one, “Magic Cross,” she made from a photo of the Grand Canyon. 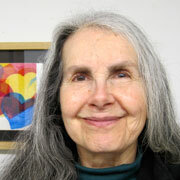 You can see a "visual index" of her "earth mandala" images at her archive site, EarthMandalas.com. If you click on one of the mandala images, the artist shows you the photos of nature from which it was made. Artist Sue O’Kieffe uses a similar process to make mandalas -- starting with photographs from nature -- but places each circle within a square. She also shifts her focus among the five universal shapes, clearing stating her conscious use of the square, triangle and spiral as well. I find her mandalas quite lovely. She even offers a free Mandala Tutorial (updated from an earlier one by Moriko) showing how to do this in PhotoShop with your own photos. (The link to the tutorial is in the right sidebar on her blog.) Note that Sue O'Kieffe's blog includes several other articles on the Angeles Arrien and the five universal shapes. "Four Spirals" mandala by Sue O'Kieffe. All rights reserved. I wrote earlier about Angeles Arrien’s Preferential Shapes Test as a tool for personal transformation. In her book “Signs of Life: The Five Universal Shapes and How to Use Them,” Arrien recommends following up the test with daily activities to lend conscious support to the core life process that wants to be actualized at the time. Psychotherapist and art therapist Kristrina Ayala describes a collage exercise she calls "Shape Your Talents" on her website. Using the five universal shapes, her exercise highlights dominant strengths and skills. This looks quite useful for vocational development. Mandala by Caterina Martinico, colored pencil. All rights reserved. Mandala by Patrician Waters, colored pencil. All rights reserved. Caterina Martinico and Patricia Waters (1934-2012) have led "Illuminated Mandala Retreat Day" art workshops integrating Angeles Arrien’s five symbols with the techniques of drawing mandalas shown by another of my favorites, Judith Cornell. Their article includes photos from the workshop as well as a collection of mandalas from the workshop. Note the cross and circle shapes in Martinico's mandala at left, and the spiral and triangle in Waters' mandala below. You can pursue this process on your own with Judith Cornell’s book, “Mandala: Luminous Symbols for Healing.” The newest edition includes a CD with guided meditations. I have the first edition, but for many years began my mornings with a tape recording I made of one of the guided meditations. By the end of the meditation, which took only a few minutes, I usually had been given the image with which to begin the day's work. Judith Cornell is still a great inspiration to me, as she is to many others interested in the intersection of art, spirituality and health. I began with her book, "Drawing the Light from Within," surely one of the most encouraging books ever written for an artist in any medium. 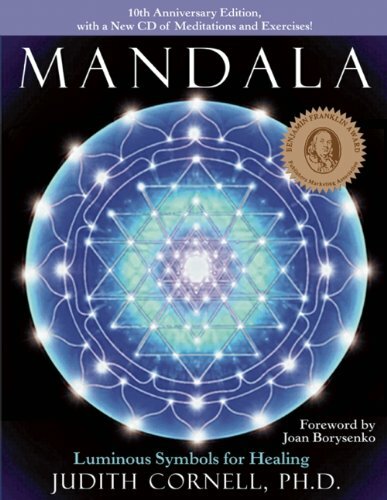 SoundsTrue.com offers her "Mandala Healing Kit" (which I haven't experienced). Some of her students and colleagues have published a video tribute to her. 4 - "Chakras and the Five Universal Shapes"